No nation has maintained such an immense stature in world politics as the United States has since the Cold War’s end. In the wake of the 9/11 attacks, prompting the global war on terrorism and the U.S. invasion of Afghanistan and Iraq, along with American economic and "soft power" primacy, there has been increased interest in and scrutiny of American foreign policy. 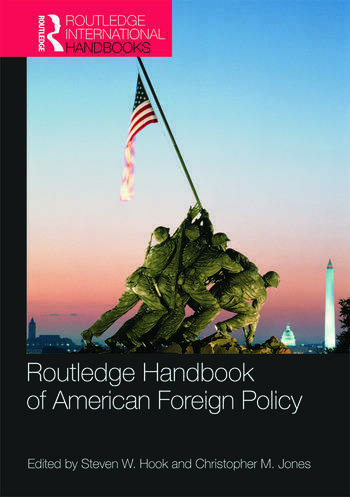 The Routledge Handbook of American Foreign Policy brings together leading experts in the field to examine current trends in the way scholars study the history and theories of American conduct in the world, analysis of state and non-state actors and their tools in conducting policy, and the dynamics of a variety of pressing transnational challenges facing the United States. This volume provides a systematic overview of all aspects of American foreign policy and drives the agenda for further, cutting edge research. Contributors bring analytic depth and breadth to both the ways in which this subject is approached and the substance of policy formulation and process. The Handbook is an invaluable resource to students, researchers, scholars, and journalists trying to make sense of the broader debates in international relations. Steven W. Hook is professor and chair of the Department of Political Science at Kent State University. Christopher M. Jones is professor of Political Science and associate vice provost for university honors at Northern Illinois University.